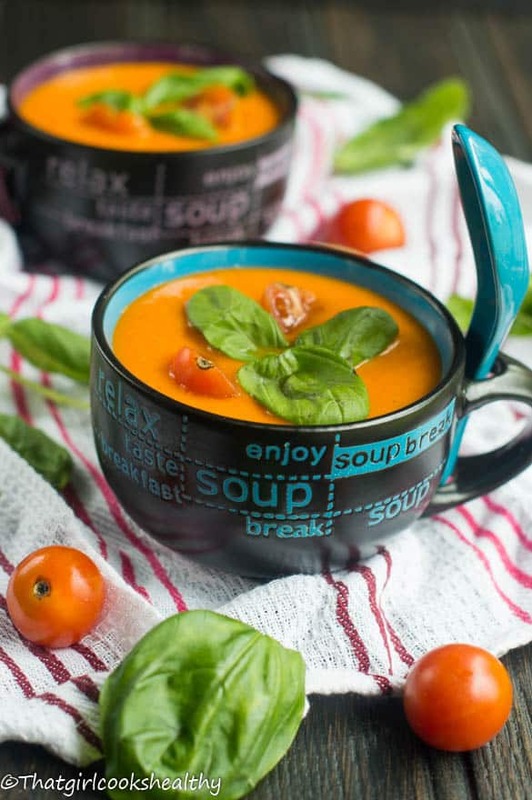 Roasted red pepper tomato soup – a creamy soup made from charred red bell pepper combined with tomato, fragrant basil and vegetable stock. I’m a huge fan of roasted red peppers, they are my favourite type of peppers to use in recipes – I adore that bright red colour and their sweet note. Depending on what the recipe to hand is, I do try my very best to opt for sweet red peppers so long as it doesn’t compromise the favour. 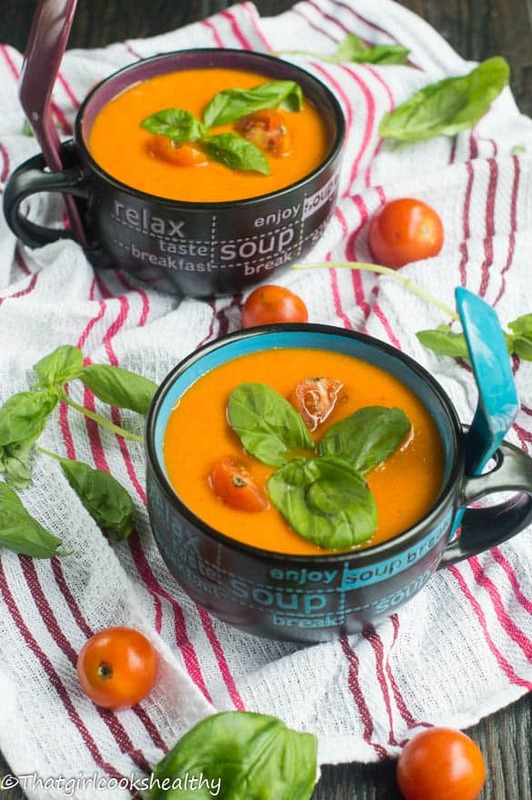 Today I thought it would be appropriate to present you with one of my favourite seasonal soup recipes – roasted red pepper tomato soup, granted the title is quite a mouthful (well not literally, you know what I mean) but the taste is mind blowing. 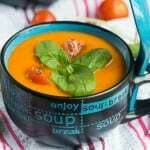 I’m very particular about tomato soup, I hate anything that isn’t mild-moderately seasoned, so much so that I seldom purchase any type of tomato soup from the supermarket. One notable reason for that is due in part to the artificial ingredients which obliterate the natural vitamins and minerals and also because of the level of sodium used to disguise the flavour or to rather mask how under seasoned the dish truly is. The above description is the main reason why I’d much rather cook my own soup from scratch. I have complete control over what goes into into the recipe and most importantly you won’t find any toxic ingredients included either. This immune boosting recipe will certainly aid sustenance doing the cold, dark and dismal days. Even though a large portion of this recipe contains sweet roasted red pepper, if you’re a guy you might want to pay close attention to what I’m about to write. Tomatoes contain lycopene a red carotene and phyochemical which is said to help fight prostate cancer. I have read several scholarly articles, all of which have cited the many health benefits for men at risk of prostate cancer and the positive association with consuming tomatoes. Of course this recipe is not gender specific, though I do feel at times many recipes have a tendency to outline the positive aspects to namely women, so let’s spin things on their head a little by highlighting the health benefits for men too. Roasting the tomatoes and red peppers are key to imparting the full flavour of the veggies, albeit this may lengthen the actually cooking process (not by too much). However, I do strongly suggest roasting the vegetables to experience the depth of flavour in its entirety. I used my trusty homemade vegetable stock too, simply click to access the recipe. This is a freezer friendly recipe. so freeze the leftovers for another day. Double, triple or quadruple the batch to freeze and reheat at your leisure. 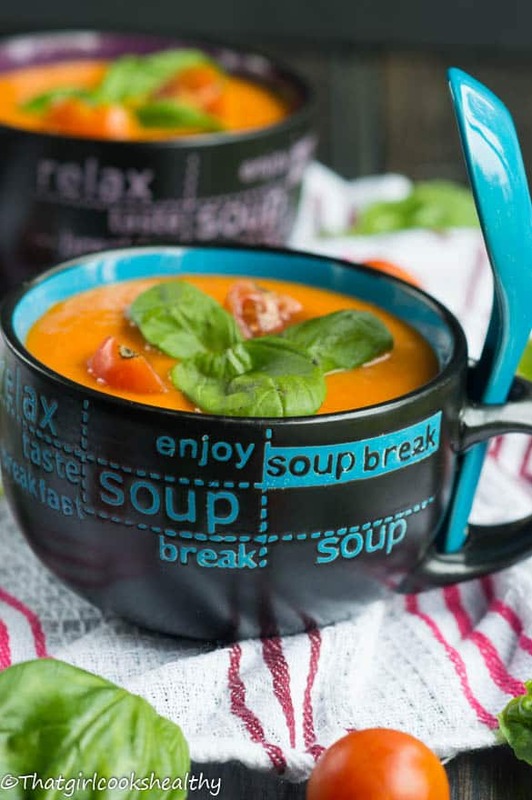 It’s your choice just be sure to whip up a batch of this delicious vegan, paleo and dairy free soup during the winter months. Line a roasting pan with parchment paper, now arrange the chopped bell peppers and tomatoes on the pan before drizzling with coconut oil. Proceed to roast in the oven for 20 minutes or until slightly charred.. In a medium sized saucepan heat the oil then begin to saute the garlic and onions for 1 minute. Add the carrot and celery to the saucepan, cook for a further 3 minutes, ensure to stir and season the veggies with the salt and pepper throughout the given time. Pour the stock into the pan along with the roasted tomatoes and bell peppers. Transfer the contents of the saucepan into a blender with the fresh basil leaves, then blend until smooth. I have been craving tomato soup recently (I think it must be the cold weather recently). I am not a fan of the canned stuff but this recipe looks so simple and tasty. Love the styling in the photographs too! 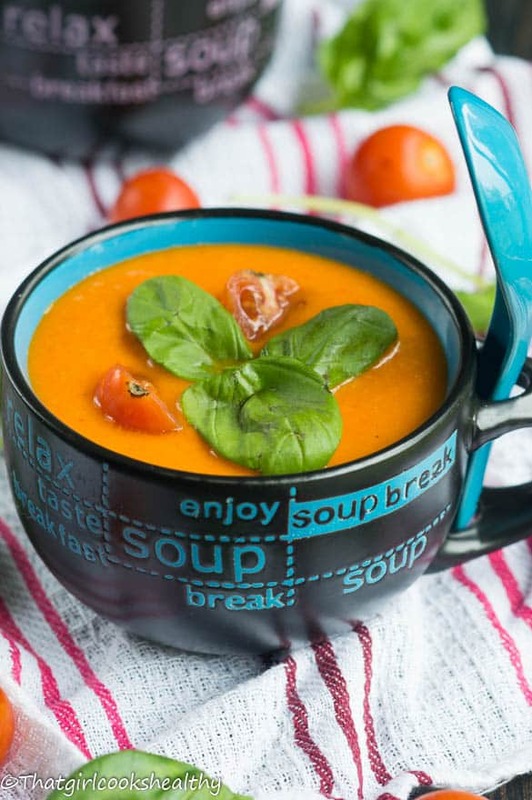 I think the brain sends a signal to our tummies that we need something comforting like soup. Thank you for the compliment I’m still learning about composition/photography. YUmmy! I love this recipe! The way you roast the peppers AND tomatoes just adds a whole new level of flavor! Beautiful presentation too! #saucySaturday link up! Red peppers are one of my favorite veggies (or should that technically be favorite fruit?, lol!). I really love eating them raw because they’re so sweet and juicy, but roasted comes in at a close second best! Will be trying this soup for sure, it looks fantastic! Thanks for commenting Jollie. Yes you’re right tomatoes are technically a fruit, though categorised as a vegetable. I hope you like this soup as much as I do. It is by far my favourite winter warmer thus far :). Wow, this made a delicious creamy low fat soup. I used a very small amount of oil and no salt, to me it didn’t need any but my tastes have adjusted to a lower salt diet. The celery left a few strings in the soup. Next time I’ll cut off part of the celery to try to avoid that. My blender isn’t a super strong one so that could be why, maybe I should try the food processor. This recipe is going to be a staple for me, thank you. Hi Jiminy, glad you like the soup. Yes a strong powered blender is recommended for most of my recipes to ensure there are no lumps etc.. The lightest part of the celery tends to be bitter, I hate that part. I would suggest omitted that part next time and using the rest of it. I have made this soup but a large version, I also roasted the garlic and this soup was awesome. You are welcome Steve. Glad you enjoyed it! !